As the NEHGS Director of Education, it’s part of my job to plan and coordinate our research tours and programs across the country and beyond the U.S. In past years, we have offered research trips to such places as Washington, D.C., Salt Lake City, London, Belfast, and Montreal, among others. Coming up in 2014, we are offering tours to Nova Scotia, Hartford, Albany, Salt Lake City, and Dublin, Ireland. We last visited Dublin in 2010, bringing 23 participants to the Irish capital, home to many of the records necessary for Irish genealogical research. Here at NEHGS, we have witnessed a surge in interest in Irish genealogy in recent years, and the demand for a return trip to Dublin is high. Back in the spring of 2013, I confirmed availability with our preferred hotel in Dublin, and the planning began. Currently, there are ten NEHGS members registered for the tour, but we do expect it to sell out at a maximum of 25 participants within the next few months. Over the past year, I’ve worked with our on-staff Irish family history experts – Marie Daly, Judy Lucey, and Jean Maguire (all of whom will accompany us on the trip) – to craft a week-long experience that will meet the needs of researchers and give the group access to the most useful repositories in Dublin. We have our hotel and two group dinners booked, orientations scheduled at the National Archives and National Library of Ireland, and a bus company expecting to chauffeur our group back and forth between those two repositories and several others. Other details, such as evening activities, our dinner menus, and the content of the participants’ information packets, are on my to-do list. I was lucky enough to visit Dublin on my own for the first time last year, and made a point of staying at Buswells Hotel, the same hotel where the NEHGS group will stay. 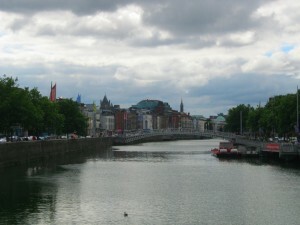 The hotel is steps from the National Library, well connected to bus routes and airport transfers, and as central in Dublin as you can get. Irish hospitality was evident throughout the city, and I have no doubt that our group will experience the same when we arrive in September 2014. For more information or to register: http://www.americanancestors.org/Event.aspx?id=29449.